In his 1977 book Exo-Psychology, psychologist and psychedelic drug advocate Timothy Leary revealed his eight-circuit model of consciousness, his theory about the workings of the human mind and the future neurological "circuits" that humanity might someday access and utilize in our travels beyond Earth. 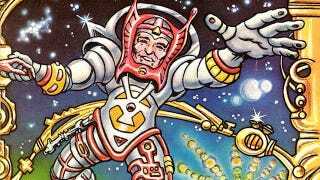 In 1979, the theory was adapted into Neurocomics, a trippy comic book exploration of the mind, human evolution, and how we might journey to the stars. Rene Walter has posted the entire (NSFW) Neurocomics online, and it provides a fascinating look into Leary's peculiar transhumanist ideas. Neurocomics is certainly a product of its era and Leary's obsessions, blending evolutionary science, mysticism, Jungian psychology, notions of panspermia, cybernetics research, and psychedelic experiences to create a rather spectacularly illustrated manifesto on what he felt humans were capable of. Now it feels like an alchemical text of a not-too-distant era, one rife with optimism about what the future might hold. Pete Von Sholly provided the artwork for Neurocomics, and Von Sholly and George DiCaprio collaborated with Leary on the script. You can read the first few pages below, but be sure to check out the whole thing on Flickr.